Millions of people around the world suffer and die from treatable conditions because they cannot afford to pay for expensive medicine. Yet the pharmaceutical industry is the most profitable in the world. Drug companies justify high prices by claiming they need to recoup their research and development costs. But nine of the top ten pharmaceutical companies spend more on marketing than on research and development. And most innovative early-stage research is actually publicly-funded. Global Justice Now and Youth Stop AIDS are holding a UK Speaker Tour from 31st October – 9th November. 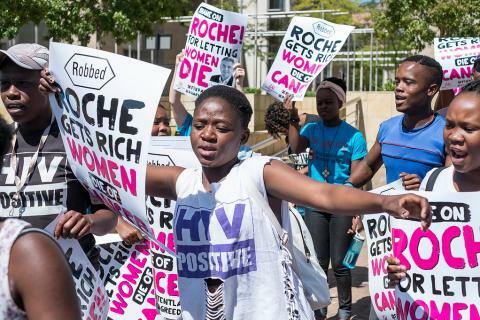 Sibongile Tshabala, the deputy general secretary of the Treatment Action Campaign in South Africa will be speaking alongside patients who have experienced the impact of expensive medicines first-hand and activists who are campaigning for change. They will be holding events in eight cities all across the UK!